T962A – Reflow oven upgrade! Description and purpose of the “M4 board”. 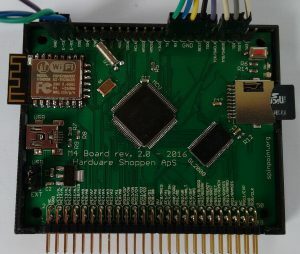 The M4 board, features as previously described a ST32F407 Cortex M4 MCU, connected via SPI to a ESP8266 WIFI module, and 18 GPIO’s routed via a GTL2000 voltage translator chip. 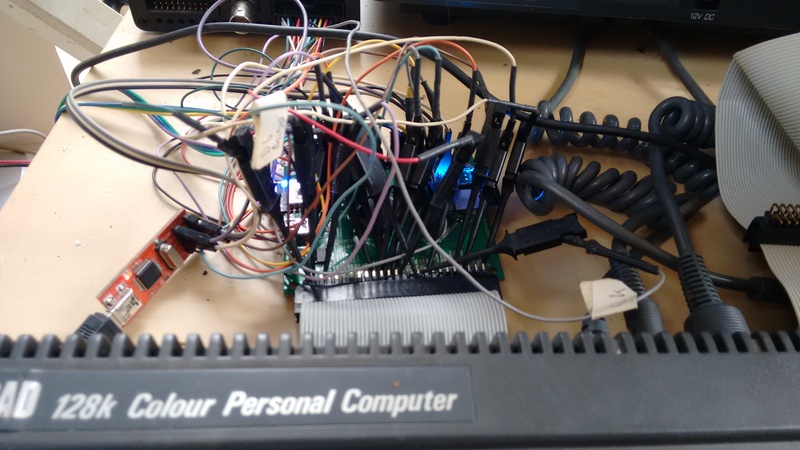 It was meant to be connected to the old the Amstrad CPC (z80 based) computer via it’s expansion port. As with most old age computers, it runs with 5V I/O, here is where the GTL2000 chip came in handy. The signals driven through the GTL2000 are output signals and the bi-directional data bus (D0-D7). Input signals are connected directly to the ST32F407 Cortex M4 as it is 5V tolerant. The idea was to provide WiFi to the Amstrad CPC, for easy and fast data exchange between it and a PC, but also direct internet access. First prerequisite was the ability to run code on the Amstrad via the M4 MCU so no additional loading (i.e. disc) would be needed. It would be done by mapping a ROM in the Amstrad addressable space, this ROM would be in the M4 ram. IORQ and WR will occur when a ROM is selected, data lines will contain the ROM number. ROMEN and RD will occur when a read is happening from the currently selected ROM, address lines have the address, ROM data will be send back over the data lines. A fairly trivial task, but the timing is tight having to bit bang the gpio, do direction changes on gpio’s mapped as data lines, even when the bus runs at only 4MHz. Much time spent optimizing the handler in ARM assembler, it finally worked. Being able to run code via the ROM board emulation, it would be nice to have native r/w storage. A micro SD card slot connected to the M4 SDIO lines, was meant for this purpose. An transfer interface from the Amstrad CPC to the M4 was designed. Two I/O ports were assigned when an IORQ happened, one for receiving data on the M4 and one for telling it data was send, so it could process. This was done as it’s easy to store data (low clock count), but takes additional time to process them. When the 2nd port is written, the MCU sends BUSRQ signal to the Z80 CPU, which will ‘freeze’ the z80 CPU at the end of the current cycle, now the M4 has the time it needs to process the incoming data, before resuming the Z80 CPU and responding. Responses are done in the ROM space, which of course is read only on the CPC, but R/W on the M4, as it is kept in the M4 ram! Next up, was to hook the system bios/firmware functions, that do file related I/O to tape and disc on the original system and re-directing them to the sdcard. Thus native file access from the SD card is possible, providing the CPC with up to 32GB (or more) of storage via SD card. In short the connection between ESP8266 and the M4 was done via SPI as IPC. To allow internet/WiFi access from the Amstrad CPC itself, it sends a command to the M4, which again sends an IPC call to the ESP. 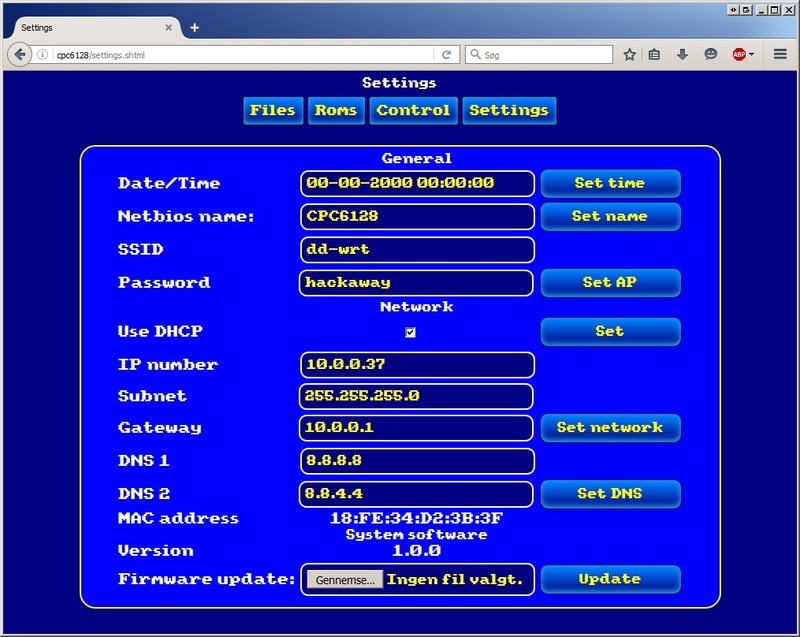 The ESP8266 hosts a WEB server, where various settings can be altered. A battery mount was put on the board, making it possible to provide Real time clock as well via the RTC in the ST32F407. Emulate Romboard, currently up to 16 roms, can be uploaded/removed via Web Interface. Download files from internet via WiFi. Mass storage to SD card, via native file I/O. R/W support. Emulated as drive A. Can use DSK files on the SD card too, but only for file read access and sector reading via firmware call. Upload files via web interface. Should anyone be mad enough to want a similar interface for their Amstrad CPC (or other suggestions), don’t hesitate to put a comment. If enough are interested, I will run a batch + it’ll motivate me to finish and polish things up. I see this is an old post, but are boards still available (assembled)? I would be interested in one. They are still available (build on demand). Lead time is about 5-6 weeks. Hi Duke, I’m also quite interested for one too. Can you please send me the details as well. I am also interested in one, would be for the 464+, I live in Spain, please email me if you see the message. Another one interested. CPC6128 here. Let me know if you still have available and the price. I’m in Spain. Leave a message here, or at the forum if you want one. Hi Duke, I’m interested in this fantastic board. I’m from Spain. When you can please email me. Thanks. Email was sent. Let me know if did not arrive. Currently it’s not open source. I haven’t decided about that yet ! This is one cool board. I really like the web interface feature. Any thought on how much is it going to be? Will this board have extra RAM, like on the Symbiface II interface? What filesystem can be used for the SD card? Fat32? The price is going to be 40 euro for the board. There is no RAM expansion build into it, I originally wanted to add another 64K (from the 192K of the cortex) but there is simply not enough processing time for the code logic, when also doing romboard emulation and I/O port transfer. Filesystem is plain fat 32. For the Schneider, yes, but you need a cable (not included with the board). You can look for MX4 (MotherX4) it should work with that. Thank you for your response. I believe the price is reasonable. I am definitely interested, please count me in for one board. Do you have any idea when a batch could be released? source? If yes, can you recommend one that would work with it? I hope about 4-5 weeks for the first to start shipping, I need to make a lot so I don’t know how long it will take. It should be OK with the CPC power supply, but you can also use an external USB power supply (5V, 1A). OK, thanks for all your answers and for doing this! Well done. I’m *really* interested in such a M4 and also might offer some very limited time in tests, bugfixing and extension. The main question resides on the M4: is it running an OS, or is it a native running application, handling the IO? I assume the later one. So some more info might be neccessary for contribution on that (I’m not an ARM specialist). Thanks. I’ll note you down for a board. The M4 is not running a OS, just bare metal. Firmware for first release is as good as ready. Hi Duke. Firstly, thanks for making things like this board. And secondly, I am really interested in a M4 too, if it is possible. Regards. Thanks. The first batch of boards is sold out already, but if atleast 10 more want one I will do a new batch (2 out of 10 now, so I think it’s possible). I’ll put you on the list. Sorry, I forgot the connector. It would be an edge connector. Thanks. Hi Duke. I received (months ago) and…it is outstanding! I wonder if it would be possible to ask for another M4, this time with a MX4 connector (it’s for a 6128+). Thanks. Good to hear. Yes it’s still possible to order more, there’s a bit of processing time needed (a couple of weeks). Just let me know which type of connector you want and I’ll add you to the list. I would like one, please! Ok, I have added you. I got mine yesterday, these boards are awesome! In a stroke it replaces the X-Mass, X-Mem* and HxC devices. * OK you still need the X-Mem for the ram expansion. Hi, I’m interested in acquiring this amazing piece for my Amstrad CPC 6128. How can I order? Cheers. Please Duke, I need buy two and m4 main board too. Send a email to me. Thanks! I want a M4 with Edge connector (I do not own MX4 board, so, i have to connect directly to my CPC). Hi Duke, I’m interested in acquiring this fantastic piece for my Amstrad CPC 6128 too; how can I order? I don’t know if it is neccesary to have any connector or similar or not, or I can connect it directly, please tell me ok? How can I order this board? Yep! Send me one asap! I would like to order a M4 board with MX4 connector and a PCB adapter assembled. Can you email me back? I would like to buy one, but I don’t know how ? I think my CPC 6128 needs this! Please let me know how to get hold of a board I can directly use with my machine. Yes, you can use it directly with your machine. I’ll send you a pm shortly. Would love to buy one too! Is it possible to be added to the list? Hi, I’d love to buy one of these too! Would it be possible to be added to the list? Duke, thanks for the email, I’ve emailed back with the details! Quiero 1 M4 board con un conector para un amstrad cpc versión española y otro conector para amstrad cpc plus versión española. ahora te lo pongo en ingles con google, por que yo solo hablo español. I want 1 M4 board with a connector for an amstrad cpc spanish version and another connector for amstrad cpc plus spanish version. Now I put it in English with google, because I only speak Spanish. I am from UK. This is such an amazing project and good to see CPC is still being expanded even in 2016. I would like to purchase a board if possible? Hello! Congrats for the amazing project. I would like to buy one M4 board. Please contact me back to arrange. Soy Manel, de España. Ponte en contacto conmigo si aún tienes el interface. El conector Edge es para los primeros CPC, ¿Verdad? Gracias. Interested here on one unit when available. I would be interested in an M4. Thanks for this amanzing project. Do you expect to make an unit with RAM Expasion? It would be the major achievement I can imagine together with unlock 8.3 chr name limitations. Would you modify this in the future or your card will be as is? I own a CPC6128+ and a CPC464. Centronics and Edge Connectors. Maybe is possible to get a conversor to use in both systems, doesn´t it? Thanks again and merry Xmass. Sorry for late reply, just got home from xmas holidays. As it is, I don’t plan to make a version with RAM expansion. There is no 8.3 char limitation anymore, latest firmware has |ls command and support long filenames. MX4 to Centronics connector 7 euro (for CPC+ and Schneider CPC6128). Hi, I’m interested in acquiring this amazing piece for my Amstrad CPC 6128. How can I order? Thanks, this is fine. Email sent. Hello Duke! I’d like to buy one board for the Amstrad cpc6128. Congratulations for the project. This looks really fett. I’d like to order one with the edge connector (regular cpc 6128) if it’s still possible. I’ve been just reading the cpwiki thread. Really fantastic job! Congratulations. Seems the final device for Amstrad CPC, from my point of view of course. That’s why I would like to know if I am not too late to order 1 board, with Edge connector, vertical position (I think it is the current version). My CPC is regular CPC6128. Thanks! You are not too late, email sent! Been getting back into the CPC scene after a few years and just found out about your fabulous work on cpcwiki. I’d like to order 1 board with edge connector for my regular 6128. If that’s still possible please send me the relevant info. I just received this some kind of miracle yesterday. I had only time to do a few tests. My first impression: MUST OWN FOR CPC. Amazing transfer speed. Lots of improvements in this updated 2.0 firmware. I had to do a lot of research but I´m glad with my Little beauty. Note: Tested only on my CPC6128 PLUS. Need to to things on standard 6128 and 464. I am interested in one plus two adapters one for old school CPCs and one for the plus range. Would that be possible? Hi Duke I would like to order one of these with MX4 connector. Many thanks. Very nice project ! I’d like to get 2 of these boards. I’d like to buy one M4 board. Hi, I’m interested in acquiring this great piece for my Amstrad CPC 6128. P.D. : You are my new God! I would like to buy am M4 board with edge connector (CPC464 & CPC6128). I own an Amstrad CPC 6128 and would like to buy an M4. Am I right in thinking that I can store DSK images on the SD card in the M4, and then run DSK images from the M4? Would I need any additional software? Is it fairly easy to use? Which would be the best M4 to get so that I can mainly run DSK images and get W-FI access? Yes it can use DSK images, just as shown in th video. No extra software is needed, everything can be configured via a browser, aswell as uploading DSK’s and files. The M4’s have same functionality, only difference is the connector (PCB layout has also changed a bit, but its only cosmetic). I’m interested in an M4 with an edge connector. Hi, I would love one of these to please. I have a CPC6128 with an IDC socket (pins) soldered onto the edge connector to if you can send one that has no connector fitted then I can take it from there. I have Paypal and CC but not BC. I would prefer Paypal if you can do that. Do you still have some in stock or will it take a while? I would like to buy am M4 board with edge connector (CPC464 & CPC6128 spanish version). I would like to buy M4 board with edge connector (CPC464) spanish version. I would like to buy one from You to my old CPC6128. I would like to order a M4 with edge connector. I’d like one with edge connector please. Please may I order one for my 6128 plus? For edge connector model (for regular CPC), price is 43.5 euro + 3.5 shipping. How to get one? Put a message here like you have done or in http://www.cpcwiki.eu/forum/ and I will get back to you. Could I order a M4 Board for my CPC 464 (UK model)? How can I have this treasure? Mail me a link to buying this jewel! PLEASE! Hi! I would like to buy an M4. And one question. Can it write to the SD disk, or only read? It can write directly to the FAT32 filesystem of the microSD card. It cannot write inside DSK images yet. Hello Duke, I wanted to say your work is amazing! It made me want to fire up my old Amstrad again. I would like to order a M4 board with edge connectors for my CPC 6128. Seen a youtube video on the M4 Board and I will be getting a Amstrad CPC6128 but the drive is faulty (I suspect a drive belt has gone) for which I have ordered a replacement drive belt. I am interested in purchasing the M4 board for the CPC6128 which I believe I will need the MX4 to Edge connector. One question if I can repair the internal FDD how will the M4 board work with the internal FDD? How much would it cost for the board and connection cable for shipment to the UK? Can you send me an e-mail containing updated pricing inc. shipping to UK for both the board and cable. Yes, it will work along with the internal FDD (|disc use disc drive, |sd use sd card). M4 board is available with both edge connector and IDC/MX4 connector (which will need a cable for Centronics or an adapter for Edge connector). Hi I am also insterested in buying an M4 wifi board for my CPC6128 please. I wonder if you can email details on how to buy if you’re still producing them and pricing. I’m in the UK. I’m hoping to buy it all ready made and ready to go so it can just plug in the back of the 6128 please with the connectors etc already in your kit? 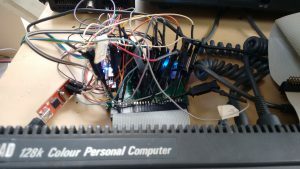 Hi I emailed also about ordering an M4 board but I was also looking at a PACE RS232 with a Wifi232 modem so I could connect to a BBS with my CPC. Does or will just the M4 board support this by itself? That would be really useful if possible? As for BBS. I don’t know, there is commands to connect to the internet (ie. httpget) and a sockets interface, so it should be possible to write software for this. I don’t have any plans to do so myself though. Hi there, really interested in buying one of these if still available? Yes, still building them on demand. Email sent. I am also interested in getting one or two. Can you also send me order info pls? Hi there! This is fantastic! I am also insterested in buying an M4 wifi board for my CPC6128 with Edge connector, could you send me details how to order it. Thank you. I’m fascinated about your M4 board. Could you send me some details on how can I order one, please? some days ago, after dedusting my Schneider CPC 464 and replacing the belt in my DD-1, i found out, that almost all of my about 30 year old disks still work fine, as well as my tapes do. First, is it possible, to use your board together with the DD-1? E.g. using the PCB adapter? Probably this was already answered somewhere, but yet I haven’t found. Second, long time ago I build a battery buffered memory for the 464. To connect it, I made a breakthrough into the housing of the DD-1 controller and soldered an edge connector on the back of the controller. Some kind of classical passthrough directly on the controller board. Do you think I can connnect the M4 board to the CPC using this connection? Or does the M4 have to come first for some reason? Due to the 90 degree solution, I am tending to order the M4 with MX4 connector and the pcb adapter. Please send me an email concerning that order. It will work fine together with DDI-1. And I think it should work with your passthrough connector aswell, but yes my 90 deg adapter might be more handy and not dependant on the DDI-1. I just found about your board, and I’m interested in buying one. Can you send me the details of how to order? 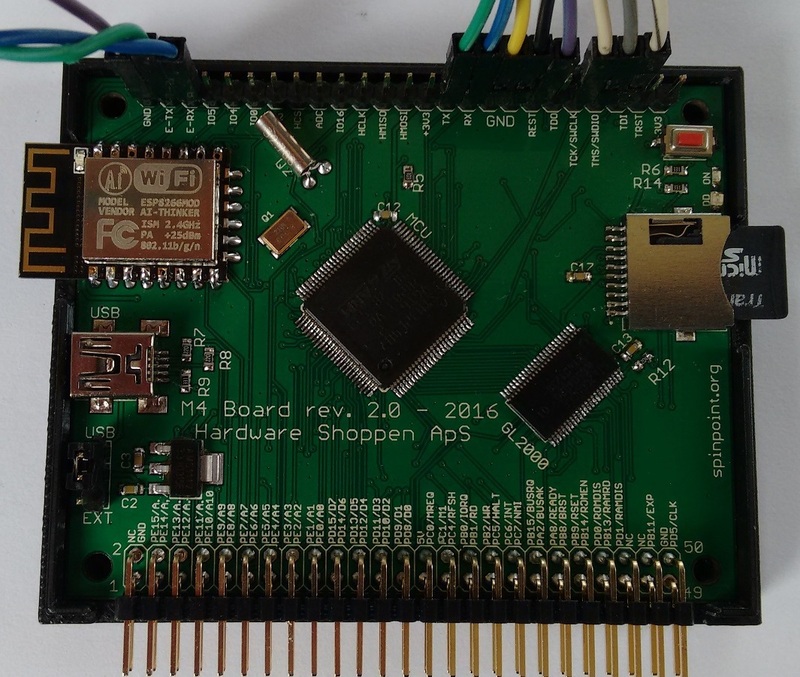 Could I have one of these wonderful boards for my Amstrad CPC 6128, please. Please let me know method of payment. I live in Sydney, Australia. Vielen Dank für die grandiose Arbeit! Ich bin schon sehr gespannt! I just learned about the M4. Great! Are the boards still available for purchase? I would love to have one of these. Hello, I would be interested in a card assembled, if they are still available or when they could be. If it is the case, please I would ask for details about price, means of payment etc. I am writing from Spain. I also would like to buy M4 (or any other additional hardware you make) for Amstrad CPC464. How do I buy one of these, please let me know!! I too am interested in the M4 if you are producing another batch. I’m interested in the M4 board for CPC 6128. I’m also interested in buying one M4 if you’re running anothr batch. Thank you for your awesome work!!! I’m interested in buying the M4 board for my CPC 6128. How to receive a fantastic kit “M4 board” for a CPC464 and 6128 ? I come back to you as soon as it’s possible for me. I am interested in buying a M4 board.